From the land of Dirks Nowitzki and Bauermann – David Hein reports on a few happenings in Germany’s top division of basketball. Read on to find out about Bayern Munich surviving a double-overtime slugfest with Brose Baskets Bamberg; Ratiopharm Ulm taking a bunch of trophies; and Vitalis Chikoko’s continued success in the Bundesliga. Bayern Munich and Brose Baskets Bamberg continued to one-up each other in a German Beko BBL showdown which should be chronicled for the as-yet non-existent BBL TV Classic. In what truly felt like a heavyweight slugfest, hosts Bayern had the final big punches in double overtime as they beat the two-time reigning champions, 107-103. Jared Homan came up big for Bayern in the second overtime with two big baskets while Bamberg just couldn’t find the answer in the second extra session. Neither team deserved to lose, but it was a shock that Bayern even got back into the game as Bamberg appeared to be rolling with a 59-45 lead midway through the third quarter, but Je’Kel Foster nailed a couple big three-pointers to will Bayern back into the game. In a contest full of amazing performances, Bamberg’s center Marcus Slaughter was both a star and a goat. He collected 23 points, eight rebounds, two assists, three steals and four blocks. But Slaughter also went just 7-of-17 free throws, including four misses in the overtime sessions. All told, Bamberg was 14 of 29 from the line for a nightmarish 48% – as a team, Brose Baskets are shootinig 76% percent for the season. 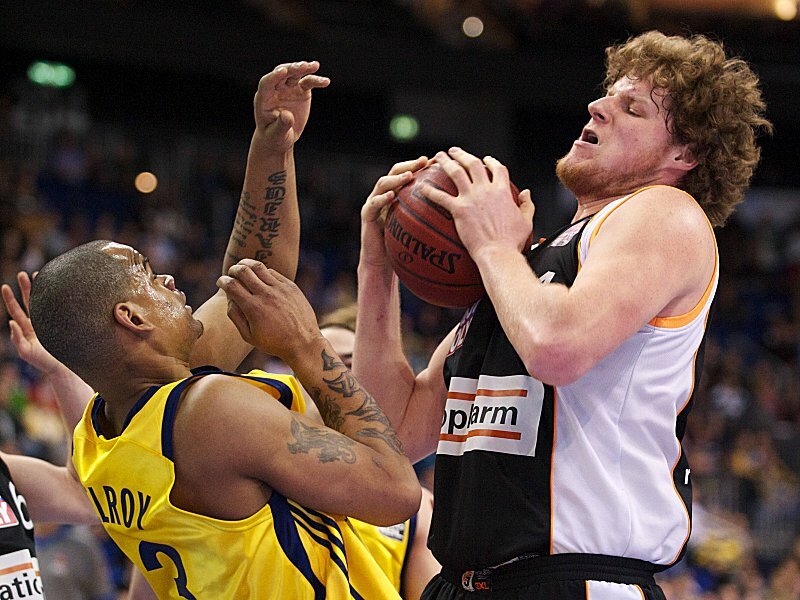 Bamberg want to quickly forget about the loss, as they host Alba Berlin on Sunday, April 22. But they are not taking it too hard as they have already secured home court advantage throughout the BBL playoffs. “For Bayern, this is probably a great victory. For us, it’s just a loss. We are in first place and we will head into the playoffs as the top team. That is the most important thing,” said Bamberg guard Anton Gavel. “Of course that was an important victory for us, one which gives us confidence. But we can’t go overboard and say that we are the greatest,” added Bayern forward Robin Benzing. Even though they have dropped to third place behind Alba Berlin, Ratiopharm ulm is clearly the surprise team of the 2011-12 Beko BBL season and it should come as no surprise that the team from southwest Germany cleaned up when the league presented their season awards. Ulm center John Bryant, who is 10th in the league in scoring, first in rebounding and efficiency rating, and eighth in blocked shots, was named the BBL’s Most Valuable Player by the coaches and captains of the 18 clubs and selected media representatives. Bryant finished ahead of P.J. Tucker from Brose Baskets Bamberg and 2010-11 MVP DaShaun Wood of Alba Berlin. Bryant also topped the BBL First Team along with Tucker, Wood, Ulm teammate Isaiah Swann and Casey Jacobsen of Bamberg. The Second Team was comprised of Jared Jordan, Bonn; Anton Gavel, Bamberg; Bryce Taylor, Berlin; Chevon Troutman, Bayern; and Tibor Pleiß, Bamberg. Ulm coach Thorsten Leibenath meanwhile picked up the award as Coach of the Year, finishing ahead of Bamberg coach Chris Fleming and s.Oliver Baskets boss John Patrick. The remaining awards saw TBB Trier center Maik Zirbes win honors as Best German Youth (U24) Player and Most Improved Player; while Wood was named the Best Offensive Player; and Gavel took home the prize as Best Defensive Player. While BG Göttingen no longer have a chance to stay in the BBL, there is one major reason to watch the 2010 Eurocup Challenge winners play out their season: Zimbabwean power forward Vitalis Chikoko. The 21-year-old 2.07m (6’9½”) big man arrived in Germany during the off-season on a four-year contract. And after months of practicing with Göttingen’s pro club and playing for its fourth-division farm team, Chikoko finally began getting BBL playing time starting on his birthday of February 11 against Alba Berlin, when he scored nine points and grabbed three rebounds. In the last four games, Chikoko has averaged 14 points and 6.8 rebounds in 22 minutes of action while shooting 66.7 percent from the field. The personal highlight was his double-double of 18 points and 11 rebounds against Eisbären Bremerhaven on April 11.